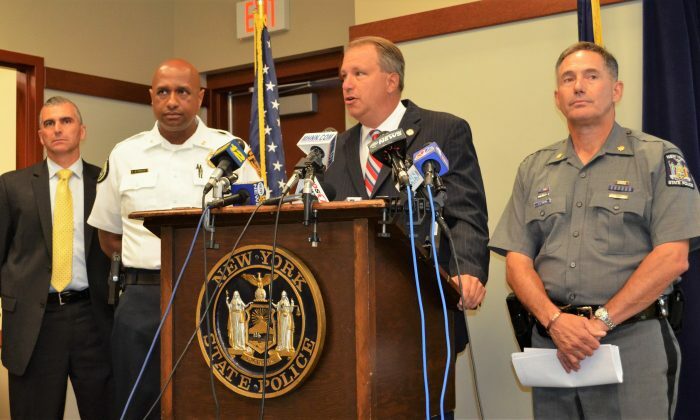 MIDDLETOWN—A press conference on July 13 at Troop F State Police Headquarters reported what is known at present of a fatal shooting by Middletown police. Richard Dinneny, 53, was shot and killed around 7:00 p.m. on July 12 at an apartment complex on Overlook Drive in Middletown by two Middletown police officers who had responded to a domestic disturbance call. Major Joseph Tripodo, commander of New York State Police, Troop F in Middletown, said the Middletown Police received a call several minutes after the first 911 call from Dinneny. Dinneny said he had a gun, he was aware there was an order of protection against him, and he had forced his way into the apartment of a woman with whom he had “an off and on relationship,” Tripodo said. On the call, Tripodo said that Dinneny threatened to shoot any police who came to the scene. Dinneny refused to drop the weapon after several orders, and both policemen fired. Dinneny came out of the apartment and brandished a pistol that was later identified as a pellet gun. He refused to drop the weapon after several orders, and both policemen fired. Tripodo said they tried to revive Dinneny on the scene. He was declared dead at Orange Regional Medical Center about 45 minutes later. Ramon Bethencourt, chief of the Middletown Police Department, said officers involved are on paid administrative leave. “Obviously, they are shaken up by the incident,” he said. Bethencourt described them as “good, hardworking officers” who are “very productive within the department.” They had not been involved in any other previous shootings, he said. He supports the officers’ actions “as I know them right now,” he said. There was no body-cam or dash-cam video of the incident. The Middletown Police Department notified the state police who arrived on the scene with a forensic unit. Orange County District Attorney David Hoovler said the investigation will follow protocol. His office will take the lead, the state police will handle the criminal investigation, and the Middletown Police Department will conduct an administrative inquiry. “The New York State Police will conduct the criminal investigation separately and distinct from any internal administrative investigation that the city of Middletown will conduct. No information between those agencies for those two investigations will be shared or crossed,” Hoovler said. The grand jury will decide if the officers’ actions were justified and if a crime has been committed. A grand jury will hear the case, and all information related to it—evidence and witness statements—will be made public, Hoovler said. The grand jury will decide if the officers’ actions were justified and if a crime has been committed.